This new tutorial is pup-approved! 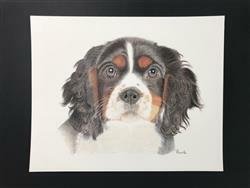 Draw a sweet little tri-colored Spaniel puppy in 30 detailed steps with crystal clear instruction and step by step images. 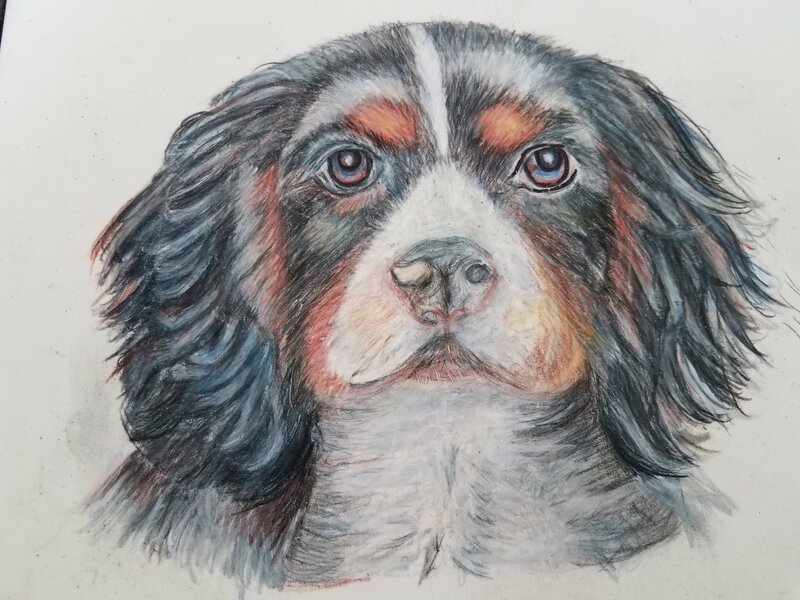 You'll spend hours gaining confidence with colored pencils while building a wide range of tones and textures - all under the precise guidance of master artist Donna Mulley. Learn techniques for gorgeous curly black coats and soft white fur - all in the same project. You will add tools to your CP toolbox that are sure to help you in future pet portraits: getting the highlights in long, shiny fur just right and perfecting the various reflections in those captivating eyes. ♦ Save a trip - Add 2 pre-cut sheets of White Pastelmat to your order. Simply choose from the drop down menu above. Faber-Castell Polychromos: The smooth, creamy application of these pencils on Pastelmat creates such luscious colors, you might wonder why you ever used anything else! Donna has selected 20 pencils to make up this multi-colored dog portrait and you'll use each one to build rich, varied hues in the fur, eyes and face of this adorable pup. 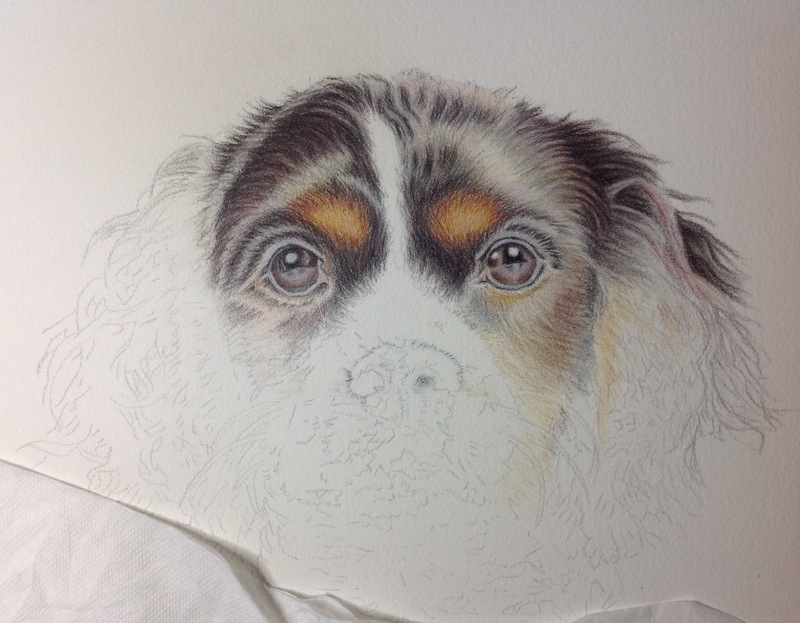 Drawing on Pastelmat: The soft background chosen for this project will allow the curly fur coat to pop and also saves you time - Pastelmat is all the rage because of it's forgiving properties and the smooth surface can also handle layer after layer to get details just right. Expressive Features: Donna helps you through the tricky part of creating multiple highlights in this dog's soulful eyes. She will also teach you to pay attention to every highlight and shape so that you can master building believable fur colors from white to tawn to dark brown. The example drawings of each step together with the written instructions were just perfect. i am still in progress doing the work. As a novice, this is a great help in setting up my work. Started a bit back to front as I am left handed. Felt maybe more deep blue to be used as I do use too much black, and realized it, went to sepia and walnut brown. However, pleased with what I have accomplished. I found the book the best type of tutorial, could so clearly steps in progress and colours used. The instructions are very clear.. I did not finished the project.. but I'm learning to draw dogs.